New Felt Alive Needle Felting Class! Yesterday was the official launch of my new online needle felting class. 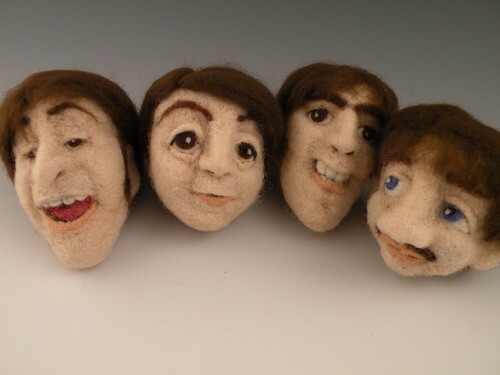 It's called The Magic of Faces - Unleashing the secrets of needle felting expressive faces! Create a unique and expressive face that is full of character and charm. These simple techniques can be repeated over and over, never making the same face twice. You will learn about basic facial anatomy and how to construct and connect the various parts of a face. Since I came out with my original Felt Alive class, I have gotten many requests for a class specifically on faces. So, I decided to elaborate on the lesson from my Felt Alive class - The Magic of Faces - and offer it as a stand alone class. I'm certain my new class will be of value to skilled needle felt artists that may simply want to learn a few new tricks! And it has already proven itself to be appropriate for beginning needle felters; as so many of my Felt Alive students had never needle felted before enrolling in my class. Their creations, especially the faces are amazing! So I think it's a great introductory to soft-sculptural needle felting as well. I think all students will learn many of the basic principles of soft-sculptural needle felting techniques. I also think it's a great way to test the waters for those who haven't decided if a complicated online class project is right for them. And for those that just can't get enough and must go on to create a lifelike body, I will offer a discounted upgrade deal for the entire Felt Alive class to my Magic of Faces Students. Fantastic Kay, I'm sure this will be a big hit. wow, your work is impressive! just found your site!!!! I can't wait to get started as soon as the holidays are over. I think I will treat myself for Christmas. You do really pretty work! I hope you'll put some new videos on YouTube! I think I've seen just about all the good ones on felting (both needle and wet felting).